Setup Red Pitaya for six HPSDR receivers | Michael Hirsch, Ph.D. 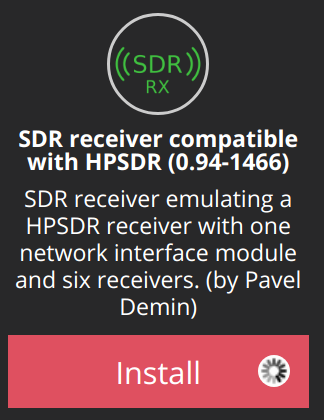 Install Pavel Demin six-receiver HPSDR from Red Pitaya marketplace. 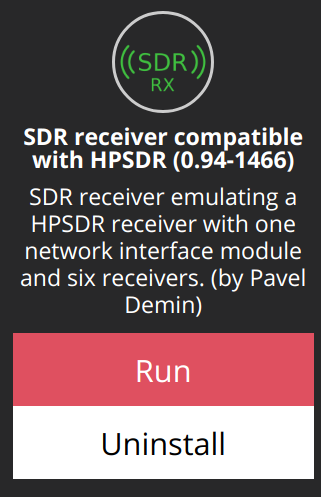 Run Pavel Demin six-receiver HPSDR from Red Pitaya marketplace (actually see step #6 to make HPSDR server autostart on boot). Where all the 1’s mean that each receiver is using RX1 SMA connector. You can configure each of the receivers to use RX1 or RX2. There are several HPSDR compatible programs on Linux, Mac, Windows. Note, at the time of this writing, the Ubuntu repository gr-hpsdr is out of date, only supporting 2 Red Pitaya Hermes receivers. note that the version 1.2 of gr-hpsdr didn’t seem to update the connection between Gnu Radio Companion and the modules yet. So I use the top_block.py directly in Python e.g. It seems that GNU Radio ≥ 3.7.10 is needed as 3.7.9 just hangs waiting for connection. Ubuntu 18.04 has GR 3.7.11 from apt install gnuradio. Ubuntu 16.04 comes with GR 3.7.9 that doesn’t work, so manually compile GNU Radio 3.7.11. Debian/Raspbian Stretch 9 has GNU Radio 3.7.10. If you do build your own GNU Radio, be sure to remove the system-installed gnuradio first, or you will have to recompile and that takes a while.